Kolkata, July 24, 2018: The Hon’ble Supreme Court of India had made an observation in 2016 by stating that, “…For a nation on the cusp of economic development, India can well avoid the tag of being the accident capital of the world.” The Union Government has taken cognizance of this matter and it stands committed to reducing road accidents by 50 per cent by 2020. 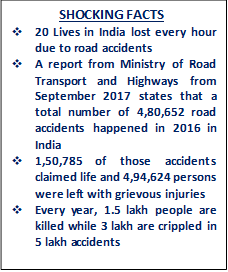 The Ministry has taken a number of steps to prevent such road accidents, including the approval of a national road safety policy. This policy outlines various measures such as promoting awareness, establishing road safety information database and encouraging safer road infrastructure among others. Over the years, the Medica Group of Hospitals, has left an indelible mark on the society by supporting the Kolkata Police and Jharkhand Police departments through a unique PPP model that has saved the lives of accidents and trauma victims. About Medica Group of Hospitals: With 1,000 operational beds across Kolkata, Ranchi, Jamshedpur, Dhanbad (Jharkhand), Siliguri and Rangapani (North Bengal), Patna (Bihar), Burdwan (West Bengal), Kalinganagar (Orissa), and Tinsukia (Assam), Medica Group of Hospitals is the largest chain of hospitals in the Eastern region of India.